We’re very nearly at the point now when we can knock all of the transfer talk on the head, at least until January. It all comes to a halt on Friday, and the word is that Leeds will be bringing at least one new face in, many tipping Chelsea’s Izzy Brown to arrive on loan. But there exists another interesting (to say the least) possibility, with the news that free agent Yaya Touré, late of champions Manchester City and still a stellar talent, has passed a medical in London, prior to a move to a mystery club. Yaya has let it be known that he’s not concerned with earning megabucks, and is more interested in a challenging project. It’s well-known that anybody who goes to Leeds, and is instrumental in the awakening of that sleeping giant, will be accorded lifelong “Legend” status. So, from that point of view, the move is not only possible, it would undeniably fit the bill for both parties. Yaya would be immense for Leeds United – if he joined up, you might as well deliver him to Elland Road as a bargain bundle to include the League Championship trophy. Whether or not English football’s new Godfather, Marcelo Bielsa, would see him as a good addition to his squad has to be another matter – and, as we know, Marcelo knows best. But Yaya Touré is still world class, he’s cheap (ish) and he’d be an amazing coup even for a major club like Leeds. It’d be a capture in the same class as that of Gordon Strachan thirty years ago. I’d like to think that this is one of those unlikely rumours that actually has legs. Desperate to deflect attention from talk of a sensational move for Ivory Coast midfielder Yaya Touré from Manchester City to Leeds United, the English champions have taken the unprecedented step of revealing proposed contract details to “Life, Leeds United, the Universe & Everything”. In a move calculated to appease their traumatised star, Manchester City have drawn up a new contract for Yaya Touré. The midfield powerhouse had been “hurt” by the club’s failure to say “Happy Birthday” as he celebrated that milestone 31st year. Touré, it is said, was grievously offended by the lack of respect, cake and a bouncy castle to mark such an important anniversary. Anxious to placate their iconic superstar the Champions have moved fast to put together a new package which should keep Touré at the Etihad until he grows up. Despite hints from the player’s agent, Dimitri “Meerkat” Seluk, that his client might pout, cry and storm out of City, slamming the door, the club itself is guardedly optimistic that the new deal will be a tantrum-breaker. The new contract will remain on the table for the time being, as Yaya is off out to play with his mates in Brazil. In the period before the contract is signed, all parties accept that Yaya will continue his present sulk, and that he will be pampered and cajoled as required until he is ready to be a good boy and sign on the dotted line. Yaya Touré is 31 years and one week old. Eyebrows tend to be raised, lips are apt to be pursed and there is a general air of bemused surprise when any Leeds United fan (this blogger, for instance) condemns racism. Those who will throw their hands up in horror – rightly so – whenever they encounter a racial stereotype, seem rather less scrupulous about imposing stereotypes of their own when their cosy perceptions about United fans are challenged. Hang on a minute, they demur – Leeds supporters are about the most racist around, aren’t they? Well, perhaps they were, once upon a time. But times change and the Leeds United fan culture of today is a vastly different thing to the bleak days of the early eighties. More of which later. The events of last week have brought the whole foul problem back into sharp focus. During Manchester City’s away Champion’s League tie against CSKA Moscow, midfielder Yaya Toure was subjected to monkey chants from the grinning morons among the home support. It’s a real problem in many parts of Europe and the one thing that’s tolerably certain is that it’s not going to go away on its own. What’s normally needed to remedy such matters is supporter organisation into a strong anti-racism movement – which was, not incidentally, the Leeds United experience – or tough sanctions from some higher authority with something approximating to a backbone. Toure may not have been alone in suffering this awful, unjustifiable and humiliating abuse – some sources report that team-mate Fernandinho may also have been targeted. Toure was understandably disgusted and has demanded action. He has even gone so far as to suggest that the 2018 World Cup, scheduled to be hosted by Russia, could be hit by a black players’ boycott. I only hope that he’s serious about that, and that he can count on the support of other black players, as this would be a shattering blow to the tournament – much, much greater today than it would have been in the eighties. A far higher proportion of the world’s best players are black today than back then, such has been the explosive development of the game in Africa, a continent where many nations are emerging as serious football powers. A black players’ boycott of the tournament, then, could be a way to apply irresistible pressure to fans and ruling bodies alike. A World Cup without many of its most mesmerising stars would be unthinkable; even if it went ahead it would be so devalued as to be hardly worth winning. Jose Mourinho has a view on the issue of a possible boycott, as he does on so many issues. 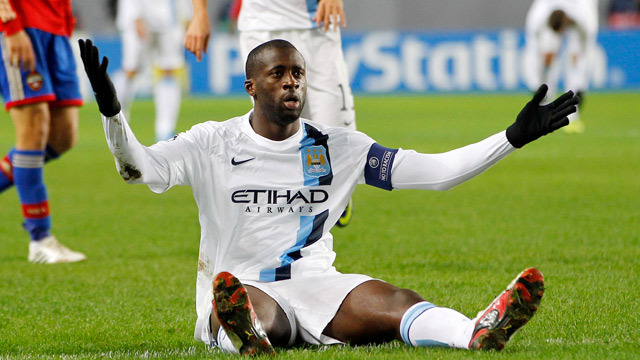 He expressed “sympathy” for Toure, but said he did not support the City player’s comments afterwards. “I respect his opinion, but I disagree,” said Mourinho. “I disagree because the history of football was made equally by many races, and the black players have fantastic contribution to what football is. “Who is more important: the billions of people in love with the game around the world, or a few thousand that go to football stadia and have a disgraceful behaviour in relation to the black players? As a football man on football matters, Mourinho’s is a voice to be respected – but in the last nine words of that quote, he basically makes the case for, not against, a boycott by black players of Russia 2018. Just imagine if you will a tournament blighted by the kind of sickening filth Toure and possibly Fernandinho had to suffer last Wednesday night. It’s too horrible to contemplate – and what message would it send out to the billions worldwide that Jose is seeking to protect from a World Cup bereft of black talent? Endemic racism is OK as long as we’re being entertained by the football? That’s not the way to go and it’s not the example to set to the world’s children. Mourinho then is surely wrong to suggest that those billions would rather witness a tournament dragged down to gutter level by cretins whose idea of fun is to abuse a world star by making crude monkey noises. The best thing an organised movement of black players could possibly do is to show FIFA that the situation is intolerable by refusing to have anything to do with such a toxic affair. Perhaps then even FIFA – a body which inspires little confidence, led by a man in Sepp Blatter who is little better than a bad joke – might consider its options, faced as they would be with a sanction of such potentially seismic effect. They certainly should consider those options, which are practically limitless. It’s certainly pointless to wait around hoping that UEFA might put their own house in order, something they’ve proved themselves singularly incapable of doing. Instead, FIFA should act, and act decisively. They should advise Russia that, unless this problem can be addressed and eliminated by 2015, an alternative host nation will be found for the 2018 World Cup – it’s that serious. They should monitor the situation, act as advised and they should then stick to their guns. They won’t, of course, because they are truly spineless and complacent – which is why the likes of Yaya Toure and the others like him who are subjected to this evil baiting, really have no choice but to rally together and organise themselves to take their own action. Good luck to them if that’s the path they take. In the early eighties the experience of being a match-going, non-racist Leeds United fan was lonely and disgusting. The atmosphere was rancid with bigotry, skin-headed, bone-headed racists sold “The Flag”, a right-wing snot-rag, outside the ground. It was done openly, brazenly. Dissenting voices, when raised, brought upon their owners the risk of violence. The club was inert and complacent. The police sat by and watched. It was depressingly, shamefully awful. And then, things started to change. Civilised, intelligent Leeds United supporters, unable and unwilling to accept the evil being dispensed in the name of their beloved club, organised themselves into Leeds United Fans Against Racism & Fascism. Fanzines were sold expounding the voice of reason against the bigoted filth being peddled by the racists. More decent supporters woke up to what had been going on, joined the anti-racist movement, bought the fanzines, started to raise the voice of protest against the ignorance and malice of the terrace chants against visiting black players. Even the slumbering Leeds United itself reacted positively to the changes afoot. Black players were signed, the first since the brief but bright Leeds career of Terry Connor. Noel Blake, affectionately nicknamed “Bruno”, loved by the Kop. Vince Hilaire, quicksilver winger reviving memories of Albert Johanneson in the sixties, the first black player to play in the Cup Final and a Leeds hero when the Revie revolution was still new. It was a painfully long, slow job – but Leeds United finally managed to rid itself of one of the most degradingly awful reputations for racism and bigotry, and they largely did it as an institution, by the efforts of enlightened fans supplemented by the club’s more enlightened transfer policy at a time when there was still an unofficial bar observed by the likes of Everton FC. I’m extremely proud of the way my club tackled its problems. The Leeds United of today bears no resemblance at all to the sick club being brought to its knees 30 years ago, dying of the cancer of racism. The whole world has moved on, though pockets of the disease still exist at home, yet far more significantly abroad. We now live in a time when these manifestations of hate and ignorance are a palpable shock to the system – and that in itself is a massive change for the better. Such inhuman behaviour has never ever been acceptable, but now it’s seen to be completely unacceptable, and FIFA above all must face up to the reality of this. FIFA simply have to act, and they have to act now. Despite CSKA Moscow’s revolting stance whereby they’re claiming this simply didn’t take place – the club’s deputy media manager, Michael Sanadze, told Sky Sports News that “nothing special happened” – they have been charged by UEFA with “racist behaviour”. UEFA though are an organisation clearly lacking in the backbone to apply sanctions and see them through, Lazio having been punished for comparable transgressions in the past, the stadium closure subsequently being reduced to a mere slap on the wrist. The message from FIFA has to be clear and unequivocal. Stop the racist abuse – or lose the World Cup in 2018. Failing that, Yaya Toure and his black colleagues – and how good it would be to think that non-black players might also support such a move – should carry with them the good wishes and backing of every decent-minded person as they seek to reduce the tournament in Russia to the well-merited status of farce. It would be no more than FIFA deserve for what would amount to tacit support of the racist minority whose venom threatens to poison the whole football world.